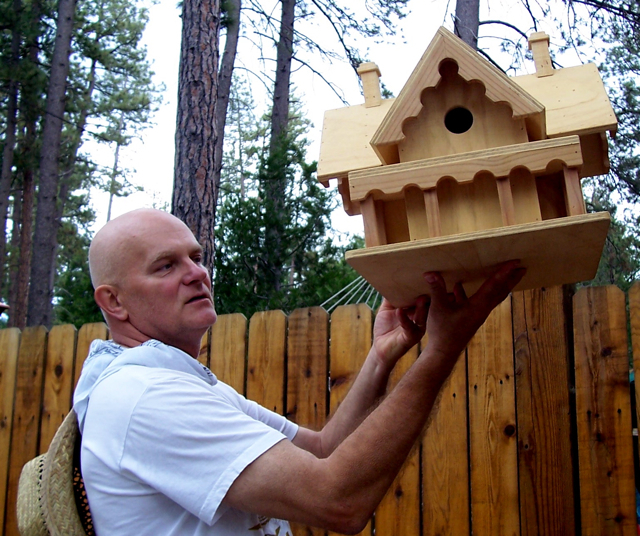 Resident Peter Hopper shows off his birdhouse "mansion"
Outside his Idyllwild home every weekend, Peter Hopper sets out tables, hardware shelves, beach umbrellas and the American flag. On display are his homemade bird houses, including single dwelling, three-room “condos,” and one unique gingerbread “mega mansion.” Stacked off to the side are flower boxes with flowers or geometrical designs on them. And around the corner is a massive bird feeder mounted on a nine-foot pole. Although these are the work of a master craftsman, it more of his “calling card,” and an opportunity to teach his two young boys about his old world craft. “These bird houses are a friendly way to get to know people,” said Hopper, who has lived with his family in Idyllwild since 2000. Hopper, is tall, clean-shaven (including his head), and speaks with a heavy Austrian accent. Although he looks like “Mr. Clean,” he is soft spoken and philosophical, especially when talking about his family. “I’m working with my boys on weekends trying to teach them carpentry–like I learned from my father in 1976,” Hopper said. “Idyllwild is a great place to be because there’s nature all around, not lots of traffic and people are friendly,” he added. Behind him in the open garage are a plethora of table saws, drills, a planer and boxes of tools. Sawdust is all over the floor and tables. “As a carpenter, you need high quality equipment,” Hopper said. He mainly does commercial work that includes installing of hardwood floors, marble and porcelain tiles, restoration of antique furniture, and plumbing that includes sprinkler and drip systems. 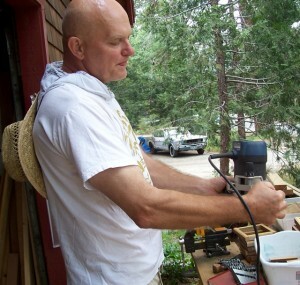 One of his recent jobs in Idyllwild was on Country Club in which he built several small decks, and an ornate brick entryway. He’d like to do more local work, so he wouldn’t have to commute to Oceanside. In the meantime, however, he’s content to teach his boys about carpentry on weekends. 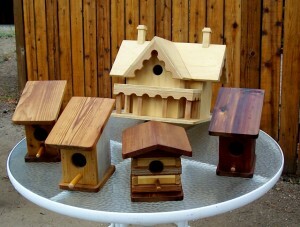 His son, Liam, age 15, helps him create the bird houses and flower boxes, while Dylan, age 9, is the salesman. Dylan’s homemade sign reveals the prices: $35 for the single-dwelling bird houses, $45 for the stacked, three-room condos, $180 for the gingerbread mega mansion, and $85 for the bird feeder. All of the bird houses have a standard-sized opening, but Hopper will custom fit them with a smaller wooden insert, if you’d like. 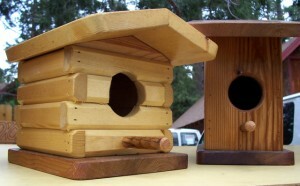 Bluebirds, for example, need smaller holes, to keep the larger bluejays out. There are primarily two styles Hopper sells, a plain one with a slanted roof, and a modified log cabin style (to match many of the homes in Idyllwild). The “condo,” bird house, coined by Dylan, has three rooms. He created that style when he had seen a tree at his sister-in-law’s place that housed as many as 50 birds. 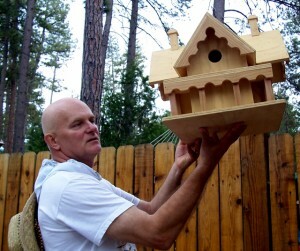 However, his latest bird house, the “mega mansion” (also coined by Dylan), shows off Hopper’s carpentry skills. There is great detail in the pitched roof with double chimneys, and the wrap-around porch. It looks like a gingerbread home you’d might find in Austria. It takes some time for he and the boys to create this masterpiece, so the price is reasonable at $180. They sold two of them last year, with one customer mounting it on a pole, while the other hung it from a tree. Although ornate, there is no paint or waterproof coating on the mansion–and the other bird houses as well. Hopper said that most of his customers prefer to paint, seal or decorate them themselves. 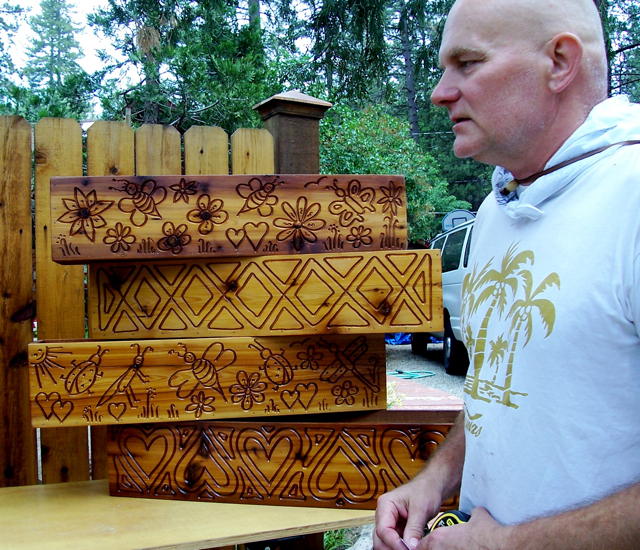 However, the flower boxes are decorated, stained and sealed with a waterproof coating. The designs include flowers, geometric patterns, and more recently, children’s cartoon faces. Hopper pencils in the design on the box to start, then carves them with a hand-held router. Then he sands it off and finishes with a wood stain and a polyurethene coating. You may have seen his handiwork outside the beauty shop in town, the Help Center, and Strawberry Creek Inn. Adding a name to the flower box costs $15 more. 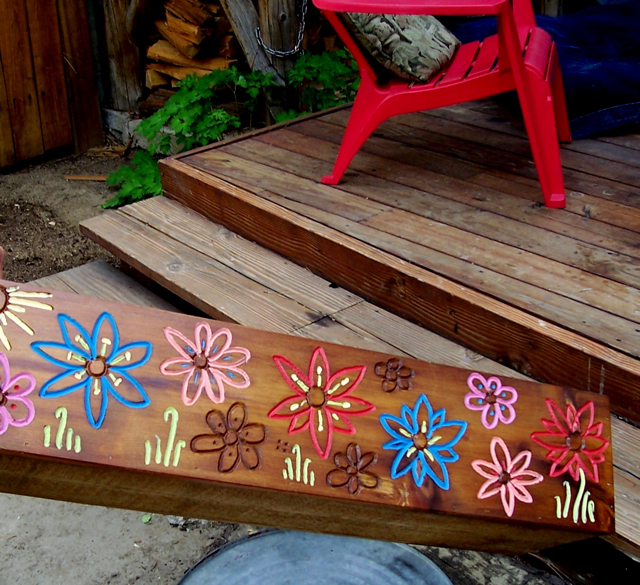 The flower box dimensions are approximately 33 inches long, by 8 3/4 inches wide and 7 1/2 inches high. Hopper recommends inserting plastic liners into the boxes so that there is protection between the dirt and wood. The liner also serves another purpose. It was also her idea to add color to the flowers on the flower boxes. “We’re always looking for ways to improve,” she said. The bird feeder that sits in front of their house is remarkable. 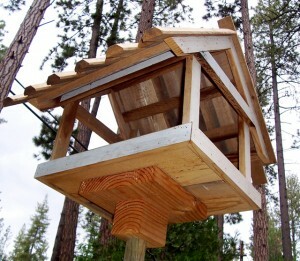 It has a large roof to protect against rain and snow, with a large opening for several birds to feed at once. There is about a one-inch rim around the bottom to keep the seeds or peanuts inside. Like the bird houses, Hopper recommends that people use a plastic liner for easy inserting and cleanup. It costs $85, but you can also purchase a nine-foot pole for $10 that can be mounted into a pipe into the ground. Some need help installing the bird feeder, and Hopper helps them for free. It’s all about teaching, family togetherness, and not so much about the money. He doesn’t have to say it. His sales speak for themselves. Last year, Hopper and his sons sold about 15 bird houses, and 25 flower boxes, but gave 50 of them away, mostly to schools and children. He knows that he could beef up sales by opening up a shop in town, or selling online on eBay. None of these options appeals to him right now. He’s been through all that, he said, 30 years ago when he worked 2o-hour days for someone else. Now, he’s just happy to do custom work and making a few bird houses with his boys. To see the Hopper family bird houses, visit them at 53675 Tollgate Road in Idyllwild, or call (951) 659-5909.